“¡Si fuera mudo, explotaría! (If I were mute, I would explode),” says the seasoned Texas attorney Benny Agosto, Jr. in Spanish as he explains his passion for teaching and mentoring. With 18 years of litigating to hang his hat on, some may call the partner at Abraham, Watkins, Nichols, Sorrels, Agosto & Friend seasoned or a veteran, but those words evoke a grandfatherly image, and one need only listen to him speak for a minute to hear in his voice the charge Agosto gets from the advisory interactions he has with students and mentees. It’s a different exhilaration than the one he gets from high-stakes litigation or the adrenaline rush of a soccer match—the latter Agosto has experienced on an international stage. But, it’s one that represents what is perhaps his most important contribution to his field and his country. Prior to entering the legal realm, Agosto was a graduate student studying bacteria at the University of Houston. Admittedly, he wasn’t cut out for the laboratory. “You have to be a special creature, so to speak, to enjoy that work,” he jokes. But he found teaching as an assistant to be an outlet and was excited by the knowledge-sharing aspect of the job. “It was a pathway for me to continue to develop as a person,” he says. Agosto found similar fulfillment in coaching the sport that gave him the means to become a teacher. Agosto attended Houston Baptist University for his undergraduate degree on a soccer scholarship and played soccer for the Puerto Rican national team during the 1979 Pan American games. A vivid memory of his father motivated to always pursue further education and never let the satisfaction of success keep him from advancing. “I don’t want you working here,” said Benny, Sr., standing in the middle of the family’s jewelry shop in Puerto Rico. “Go out and be bigger than me.” For the last two years before law school, Agosto coached at his alma mater. He knew that he wanted to continue learning, but didn’t want to return to biology, so, without overthinking it, he chose law. Before Agosto became president of the Mexican American Bar Association of Texas (MABATx), he didn’t just aspire, but made the decision, to be a leader as a minority lawyer. When he got his chance to lead the organization in 2005, he made good on that commitment. He realized two things: that the legal field, and even the law firm where he worked, were sorely lacking minorities and that MABATx had no foundation or charitable outlet. Nationally, as well as in Texas, the number of Hispanics entering law school was not proportionate to their population. Agosto created the Mexican American Bar Association of Texas Foundation, and it has been his vehicle for change. Since its birth in 2006, the foundation has funded more than $100,000 in scholarships for Hispanic law students in Houston. “There’s a disconnect between the educational goals of Hispanic students and the opportunities for them to study,” Agosto says. “More Hispanic students should be going to professional schools,” and through the scholarships, he hopes that becomes a reality. 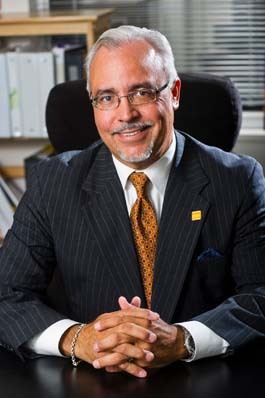 Agosto took that fight to Washington, DC, in 2011 when he served as president of the National Hispanic Bar Association. Declaring his term “the year of the advocate,” he used the organization’s Capitol Hill clout not just for the benefit of law students, but for the good of the Hispanic community as a whole through such means as immigration reform and job creation. In June of 2013, Agosto’s work was recognized by Hispanic Issues Section of The State Bar of Texas, which awarded him the Peter Torres, Jr. Community Service Award.